Photo Solutions can assist you with some basic editing of your videos. This could include cutting out unwanted segments, adding captions or title screens, removing or adding audio and combining multiple segments. Other editing effects can be done, but please keep in mind that we do not have the abilities of Hollywood and cannot create an Oscar contender from your video clips. Audio or background music can be added to your silent movie videos, but you will need to provide the music either in CD form or some other medium. Due to copyright issues, Photo Solutions cannot provide the music for your video. Photo Solutions charges $45.00 per hour for video editing services. There are tasks that you can do yourself to minimize the cost of editing. You can view your video at home and write down information, such as the beginning and ending time of the clips you wish to cut or add, you can give our technicians a short description of the clips, and you can have the tapes cued up at the beginning of the clips. 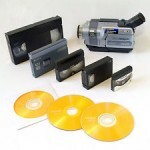 All of these will help us to use the time for actual editing, not searching for clips on your tape. While we cannot make your home videos into the next Oscar winning blockbuster, we can help you make your memories better with a little bit of help from you! Once the video is done, you can purchase additional copies to share with family and friends. A video of memories from throughout the years makes a great gift for birthdays, anniversaries, graduations, and many other milestones. Call us today to discuss your project.